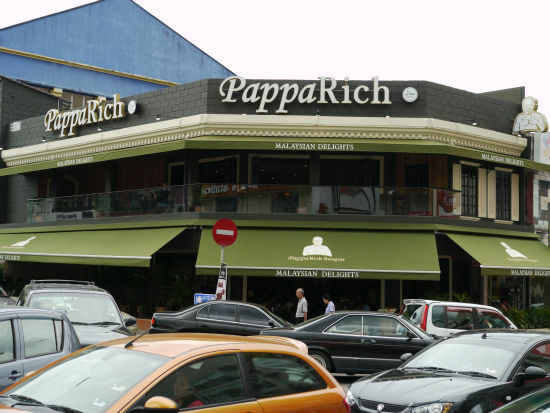 In late 2009, Bangsarians and Bangsar visitors were treated to the opening of PappaRich Restaurant in the corner lot opposite Hong Leong Bank. The previous tenant there was "The Roof" which was a popular drinking place during its hay days.. For a long while after that, no tenant dared to take up this empty lot for the fear of bad "Fung Shui" since business didn't seem to fare too well at this lot. However PappaRich has taken up the challenge and shown us otherwise. Since its opening late last year, the restaurant has been packed with customers looking for a pleasant and enjoyable dining experience. PappaRich has a good and simple concept. All PappaRich restaurants have nice decorations and ambience and relatively cheap and affordable food. Relatively is mentioned because you can never beat the price of "Coffee Shop Food" around Lucky Garden but with the slight extra charge, it sure beats having to sit in a crowded and stuffy coffee shop. We are sure most people wouldn't mind paying extra for this comfort. The type of food offered at PappaRich is plentiful. Basic dishes include the simplest basics of PappaRich bun or Bread with Butter and Kaya and more complex and filling ones include their delicious Curry Laksa, Nasi Lemak, Fried Noodles, and many other local delicacies. Drinks offered include Hainan Cham, Pappa Cham, Kopi (Coffee), White Coffee & etc. To check out their extensive range of food and deserts and also dim sum offerings, you should check out their menu at http://papparich.com.my/menu.html.